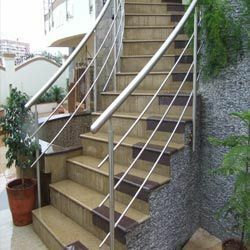 We have established ourselves as a leading manufacturer and supplier of a commendable range of Stainless Steel Railings in Pune. Offered range encompasses Glass Railings, Stainless Steel Railings with Glass, Handrail Railings and Stainless Steel Glass Railings. Manufactured with premier-grade stainless steel and other required raw material, these products are highly valuable for commercial as well as domestic areas. 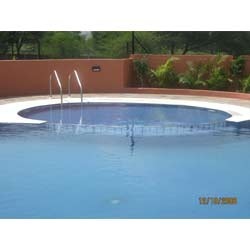 We designed these products as per the specifications given by our clients situated across the country. We provide our clients with the quality approved Stainless Steel Swimming Pool Railings. Our stainless steel products are accepted as well as appreciated by the number of clients due to its optimum quality and efficiency. Apart from this, the offered product-line is designed using high quality raw material at the production unit of our organization. 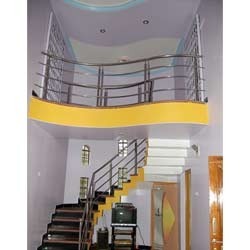 We are offering our clients with the high quality Stainless Steel Stairs Railings. These rust-proof railings are widely appreciated by our clients due to their reliability features and safety features. In order to ensure strong and durable products, these products are properly checked by the team of skilled professionals. Keeping in mind the exact requirements of the clients, we are providing them an exclusive array of Handrail Railings. 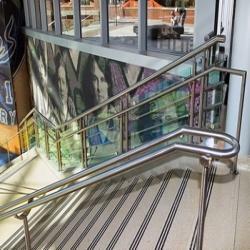 These railing are designed by our professionals with premier-grade stainless steel. Required raw material is collected from the from reliable vendors after comprehensive market research. Tested these products on different quality parameters before delivering to the clients. Owing to their quality and perfect design, these railings are widely used in staircase, mezzanine floors, balcony, deck and ramps. Backed by our vast industry experience, we have been able to manufacture and supply a remarkable range of Exterior Stainless Steel Railing. To meet the clients varied expectations, we are providing this railing in different designs and shapes. It is highly suitable for domestic as well as commercial structure and enhances beauty of the exteriors. Moreover, it is available in the market at reasonable price range. 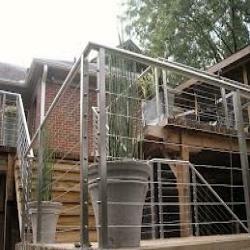 Patrons can avail from us the optimum quality Stainless Steel Railings. The product we offer are manufactured using high quality raw material and advanced machinery to ensure high strength and durability of the railings we provide. Moreover, these products are also customized as per clients' requirements and specifications at the most comprehensive range of price. Leveraging on the support of our sound infrastructure, we are able to come forth with the sustainable gamut of Stairs Railings. We have hired deft team of professionals to test these products before the dispatching to ensure the optimality of the offered product. 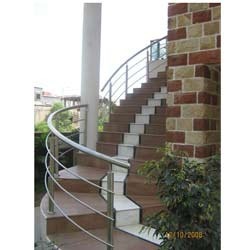 Our respected patrons can avail these high quality railings at the most comprehensive rates. In order to cater ever changing demands we are offering optimum Stainless Steel Railings to our costumers. These assured quality products have ability to withstand even severe conditions. The products we offer are reliable in terms of durability and performance as they are fabricated using high-grade raw material, sourced from the most leading vendor present in the market. 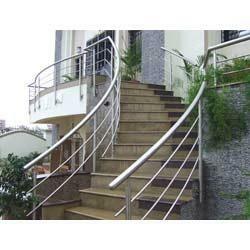 Our organization is counted amidst the eminent manufacturers and suppliers of a wide range of Stainless Steel Railing. This railing is manufactured with premier-grade stainless steel sourced from the leading raw material suppliers. Our highly skilled professionals incorporated modern technology to manufacture this product with superior-grade stainless steel. We design this product in accordance with the clients' specifications so as to meet their distinct demands. Furthermore, to ensure its wide applications in both domestic and commercial sector, we are providing this product in different designs, shapes and dimensions. 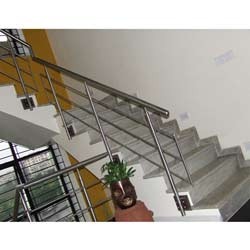 Looking for “Stainless Steel Railings in Pune”?